The Gays, Lesbians, Bisexuals, Transgenders, and Friends at MIT display case in the Infinite Corridor was vandalized on Sept. 4 at about 1 p.m., said Chief of Campus Police Anne P. Glavin. "Someone, or some people, sprayed pink foam over various posters, the words �We're Here! We're Queer! 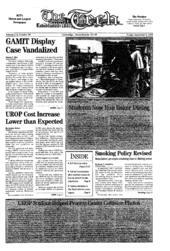 ', and images of various couples kissing in the GAMIT display case," said Celeste D. Winant '95. Winant immediately filed a report with Campus Police after seeing the vandalized display. At the request of Campus Police, workers from Physical Plant cleaned up the pink foam on the display. "There is no evidence of who committed the act," Glavin said. "Even though MIT cannot prevent [the perpetrators] from acting hatefully and stupidly, their actions will not be tolerated by the queer community or by any other sensitive person for that matter," Winant said. GAMIT Political Coordinator Joaquin S. Terrones '97 said that GAMIT is planning several activities in response to the recent vandalism and other incidents. GAMIT is planning a poster and flyer campaign to increase awareness of homophobia at MIT, he said. In addition, "We've invited Warren J. Blumenfeld [author of Homophobia: How We All Pay the Price] to speak at MIT on homophobia," Terrones said. Blumenfeld is also the founder and first director of the National Gay Student Center. Blumenfeld visited MIT last March for a forum on homophobia, after Lambda Chi Alpha members vandalized the sidewalk outside the house of Tau Epsilon Phi. The LCA members spray painted the words: "To TEP --> 33 NERDS + 1 QUEER," alluding to the inscription on the Harvard Bridge which reads: "To MIT --> 364.4 SMOOTS + 1 EAR." "I wouldn't say that these acts [of vandalism against student groups] are frequent, but they do happen," Glavin said. Winant said that she does not expect the response to Sunday's vandalism to be as strong as the response to the LCA/TEP incident. After that occurrence, President Charles M. Vest sent letters addressing the matter to all MIT students. In addition, the Interfraternity Council mandated that LCA sponsor a campus-wide forum on homophobia awareness where Blumenfeld spoke. "You could at least blame specific people" involved in the LCA/TEP vandalism, Winant said. "No one knows if it was even someone at MIT who was responsible this time," she said.